It all started when i thought id take my engine out to fix a couple of oil leaks as theyve been slowly winding me up and then decided to take the gearbox and transferbox out to clean up!! So with the running gear out i thought id look behind the foam for a peek and i wish i hadnt lol found some rust just at the bottom of the drivers side just below the brake reservoir had a bit poke as you do and made a hole so thought F***!!!!!! basically all those years of bleeding brakes fluid has ran down and took the paint off and filling up the header tank with water and spilling it has basically sat there and has been slowly eating the car away!!!! So i would advise all calibra owners to have a look and repair if necessary as you could leave it to late!!!!! so thats how it stands heres a couple of pics of the work so far!!! you going to do a wire tuck while your at it ? v6 steve wrote: you going to do a wire tuck while your at it ? Dont think ill go that far Steve as that will be a nightmare with the amount of wires there is!!!!!!! heres a bit of an update!!!! Will take more pics as I progress. I must be bloody mad!!!! must have missed something.....but why all the welding?? Cheers steve hopefully wil be going in to get painted next week!!!!! Fraz wrote: must have missed something.....but why all the welding?? Welding the seems up so when i apply the filler it doesnt crack!! Well the cars all prepped and off to the bodyshop for a lick of paint!!! Heres a couple of pics of the cally ready to go!!! 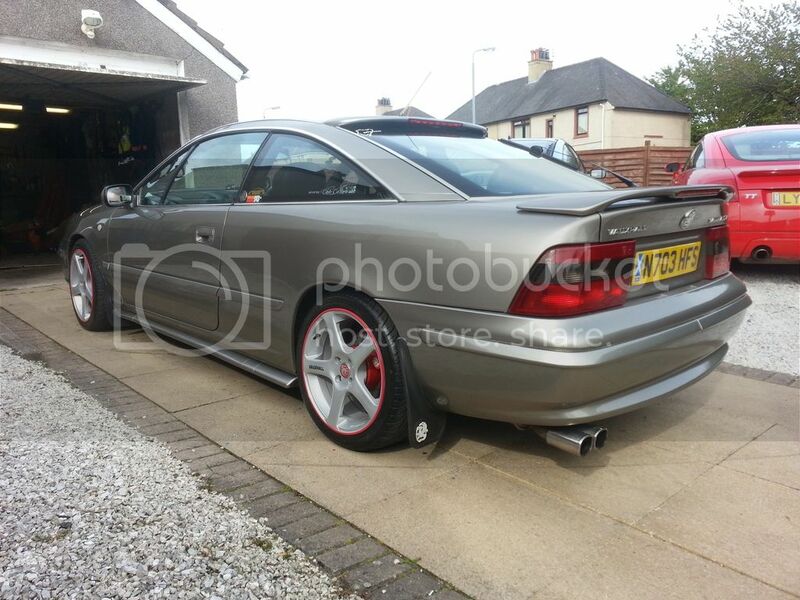 Cant wait to get it back then the fun begins!!!!!!! Cheers Rich might take you up on that!!! !